New Zealand in recent years has become the most popular study abroad destination for international students worldwide. It is the fastest emerging destination among Indian as well as other international students for quality education and a conducive learning environment. From the past few years, New Zealand has witnessed consistent growth in getting more students to Study Abroad in New Zealand over other countries. The main consent for international students while planning to Study in New Zealand is that they have an excellent global education system. 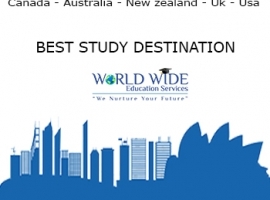 Here are some points which provide that New Zealand is the best study destination for study abroad. One of the lowest tuition fees in the world. For such a low cost get the British based education with degrees globally recognized for carrying the latest modules and practical approach. The certificates and course programs are thoroughly scrutinized by the universities in New Zealand to maintain high standards and high quality. One of the great support structure for international students to help them assimilate and succeed in their study in New Zealand. Also, there are several factors such as availability of job market, economic stability, affordability, safety, political stability, and health care all these blends together giving out a perfect experience of the lifetime. Study abroad in New Zealand is well known especially for the quality of life that it has to offer. Here with Study in New Zealand, a student can also get the best adventure for free to explore the country’s wilderness in its mountains and beaches. Here you can get the big chance of making lifetime friends and social network. One of the main reason for Overseas Study Visa for New Zealand is that the education programs and degrees are based upon the British education system. As a colony of the British Empire, they follow the tested and most recognized system of British education. Why Should you Study in the USA?